If you want to edit as well as create some of the unique collages of your pictures, then the solution is the ‘Photo Editor’ app. The Photo Editor app allows users to edit photos and make collage using its Pip collage, Grid collage and Photo editor. 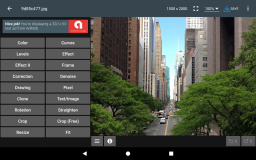 Now edit your photos easily and instantly with this app that has been recognized to be one of the best photo editing tool on the Android. With its beautiful photo frames, create the amazing colored effects in your photos. With Grid maker, stitch pictures of various grids to make one. Stitch photos by using different collages to make a perfectly stitched photo. With Collage maker, make different collage layouts. The app offers various pip camera frames as well as pip collage frames. Changing the color of the photo. Making use of lovely photo frames. Mix various images with various frames and shapes. Add a background to the picture with ‘Gradient’ option. Use the Pix Frames for creating amazing photos for social media sharing. Add text, sticker or art to a pic collage. What's new in this version of Photo Editor?